Throughout the month of November, Girl Who Reads will feature books from authors who are participating in National Novel Writing Month. These authors are attempting to write a 50,000 word novel in 30 days. A child emigrates from Spain to Puerto Rico in 1870, adapts to a new culture, and strives through hurricanes, disease and war, becoming a prominent tobacco planter. 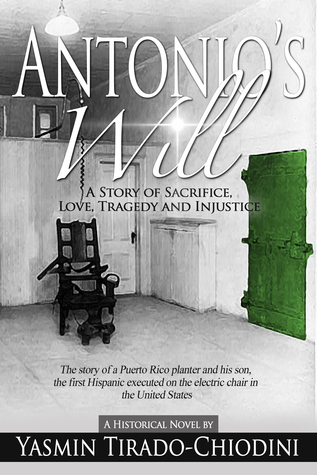 With high hopes, he sends his son to Albany Law School, but instead, the young man loses his will and becomes the first Hispanic executed on the electric chair in the United States. The author, a lawyer and genealogist, is inspired by the ghost of the executed man to expose the injustices committed against him. Amidst a historical, cultural and legal backdrop spanning three countries and over a century, the story uncovers the tragic events, the trial errors, the prisoner’s struggles at the Sing Sing penitentiary, and the wrongful execution, highlighting the need for constitutional protections and equal justice. Yasmin Tirado-Chiodini is an attorney, biomedical engineer and family historian. She is a former Space Shuttle engineer and Adjunct Professor of legal ethics and negotiations for the Executive M.B.A. program at Rollins College, Crummer Graduate School of Business. She is also a recipient of the Top 25 Central Florida Hispanic Influentials, Women Who Make a Difference, and Don Quijote awards, among others. In addition to authoring “Antonio’s Will,” telling the story of injustice of the first Hispanic executed on the electric chair in the United States, she is also the author of “Does Your Compass Work? A Legal Guide for Florida Businesses” and frequently publishes in various media. She has a solo business and intellectual property law practice and lives in Florida with her husband, daughter and their four Labradors. Girl Who Reads is an Amazon advertising affiliate; a small fee is earned when purchases are made at Amazon through the above link. Author photo and bio are from the author's website.